An Acura NSX is a nice place to sit. You ride low in a comfortable leather-wrapped cockpit designed for driving pleasure and speed. But when you know what that 573 horsepower supercar is capable of, being forced to drive it slowly and responsibly over normal city roads is the worst. Perhaps if you left the NSX in silent mode, driving through town would be okay. Silent Mode only uses the car’s electric power, which makes it soothingly quiet and tame. There are no noises emanating from the NSX’s 3.5-liter mid-mounted V6 to remind you that it’s there, yearning for full throttle. Like the MDX, the NSX has several drive modes. I enjoyed its most aggressive setting, Sport+, the most, as it was the loudest and most responsive. There was an even fiercer, stiffer and faster Track Mode we didn’t get to test, but that sounded relevant to my interests and where I’d rather be driving this car. The knob that swaps to the more aggressive drive modes sits right in the middle of the dashboard, and it’s huge. It’s even fun to use. Rotate it over and pop! You’re in the fun zone. You want it in Sport+ mode. The knob knows it. You know it. Twist it, and hoon. If you’re in even the tamest of the regular, non-electric-only NSX drive modes, the car is a tease. Tantalizing noise gets piped back into the cabin for maximum loudness. The steering is responsive, and the brakes are reassuringly grabby. The whole package feels overkill at normal road speeds. Worst of all, I used to live in the Seattle area, and part of the loop we drove was on a road that went straight to Pacific Raceways in nearby Kent. That’s right: a magical land where you don’t get tickets for speeding was within my grasp, but I wasn’t there. That fact alone was torture. Places like Pacific are the NSX’s natural habitat. On normal roads, you can have some fun flooring it up to 40 or 45 mph or whatever the speed limit is, but that’s kind of a knob move. Certain less populated spots on our loop allowed me to press the throttle down and giggle like a madwoman, but I felt shorted when I had to lift off so as not to exceed the speed limit. It’s the world’s biggest bummer. In a normal car, that kind of floor-it-everywhere thing is easy to resist, but the NSX’s engine growl and rush of torque encourage you to act a fool in every single way possible. It plants you back into your seat. It’s fun. Perhaps this is the problem with the modern supercar. They’re brilliant on race tracks, twisty roads and even out on the open highway. The NSX is even comfortable inside. The ride is deceptively smooth, and you could even daily drive it with ease if you’re just hauling yourself and another person. Supercars also have a spectacle-factor that’s undeniably kind of fun. The mere presence of such a rare car can put a big, dumb grin on someone’s face. In a more populated area, I probably would’ve enjoyed making a few car geeks’ day in Acura’s latest, greatest supercar. However, for our short loop through a small town, I actually would rather have been in something with a lower limit of capability. If I have to behave myself, I need something that’s more engaging at low speeds. Less power that forces me to rev the snot out of every gear is always a solid bet for low-speed action. You can’t do that in the NSX. 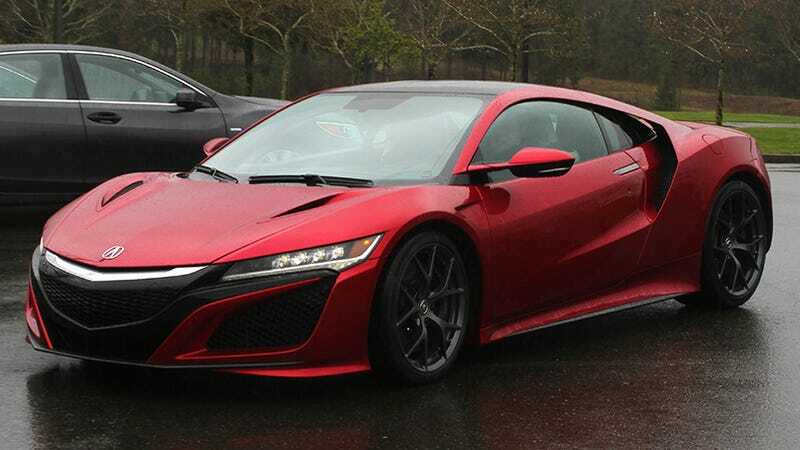 The NSX’s limits are so high that even on wet roads, it practically begs for a reprise of Patrick George’s article about getting jailed in Virginia. At low speeds, the NSX is mostly a big, shiny reminder that you’re not having enough fun.